Warning: All pilots should be aware that top landing at this site should be avoided due to rotor. At high tide the beach is very small so great care must be taken. Site Description: 80ft – 100ft Black Cliffs. This cliff is the one in front of Haven Holiday Park. This is the best place to stay up on the towans if it’s a light North West direction. It’s the highest part of the towans and has a good bowl in the cliff that produces some good lift. How to get there: Drive through Hayle and turn off towards ‘The Towans’. Follow road through Phillack and up and onto the towans built up area. Drive as far as you can on this road until you get to the Hayle ‘Bluff Inn’. Park at the ‘Bluff Inn’ it’s the safest place to park and then it’s then a 5min walk to take off. Vehicle Access & Parking: Very good. Rigging Notes: Use common sense and consideration for others. There are people that will walk over you wing if you leave it on the launch because of the foot path (so don’t). air in front of launch clear. Launch Notes: Take off is next to the look out bomb thingy to the right of the cliff as you are looking out to sea. Take off is a little path that has a few pot holes. 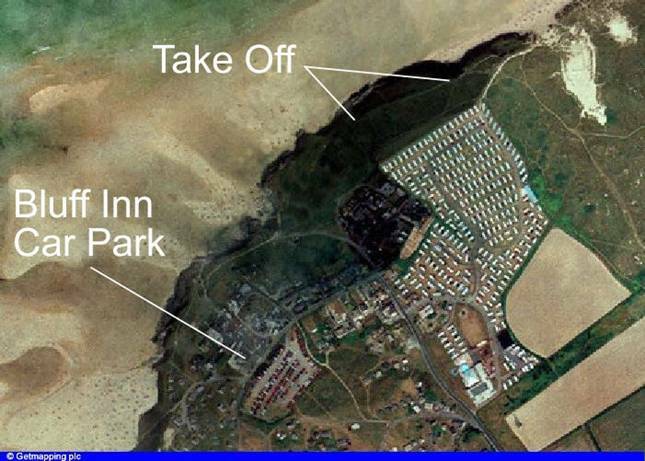 Top Landing Notes: Pilots are advised to always land on the beach. Bottom Landing Notes: Anywhere on the sandy beach at LOW tide. Hazards: Military low flying. ROTOR is here way behind take off so watch out. No beach landings when tide is in.